Update: The California state Senate on Wednesday voted to pass a bill restoring net neutrality protections. SB 822 passed 23-12 along party lines, with all Republicans voting against it. With the California state Senate on the cusp of voting on a net neutrality bill Wednesday, its advocates are urging constituents to grab their phones to demand their legislators stand up for an open internet. CALIFORNIA: ISPs have descended on Sacramento to stop #SB822 — which would save #NetNeutrality in CA. If this bill is going to pass, your senator needs to hear from you. Call them NOW! 916–823–9612. SB 822—a bill deemed the “gold standard for states looking to protect net neutrality” in the face of the federal rollback by the Republican-controlled FCC in December—was authored by state Sen. Scott Wiener (D-San Francisco), and has advanced despite attacks by internet service providers (ISPs). ISPs aren’t letting up on their fight to defeat the measure. AT&T, Comcast and two major industry trade groups reported spending nearly $1 million on lobbying in Sacramento in the first three months of the year alone—including against SB 822—according to documents filed with the California Secretary of State. Weiner, for his part, joined organizations including Color of Change and the Center for Media Justice in Sacramento on Tuesday at a rally in support of SB 822. “Net neutrality impacts everyone in our state, and we need to do everything we can to ensure that the people of California can decide for themselves whether, when, and for what purpose they are using the internet,” he declared. If the bill passes the state Senate Wednesday, it then heads to the Assembly. 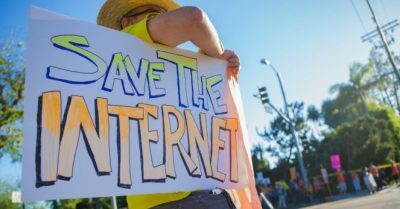 At the federal level, meanwhile, net neutrality supporters have their sights set on a Congressional Review Act (CRA) resolution to restore open internet protections. The Senate passed the resolution this month, so now its proponents are focused on achieving a similar victory in the House.